That’s what people who ate it said about Bryanna’s Vegan Espresso and Triple Ginger Cake. Personally, I loved the cake, perfect texture and flavor, but found the frosting terrifyingly sweet (maybe I just don’t eat enough icing). Ginger/coffee is a pairing that is liable to inspire doubt. I did it as an experiment for my partner’s birthday, since he adds fresh ginger to his pancakes and top-rates coffee-flavored ice cream. The experiment was a success. Frosting sweetness aside (it was still good and coffee flavored), my only regret was that my cake wasn’t shaped like little androgynous figures commonly called men. Mostly because the allspice made the cake taste like spongy gingerbread tenderized with pureed apples. On recipe specifics, I used black strap molasses instead of light molasses, halving the amount required and compensating with double the apple sauce (just a rose apple pulverized in a blender). I used almond milk and sunflower margarine, which needs to be melted. For the frosting, I went with brewed espresso instead of powder and whipped that coffee-fat-sugar tripartite with fork and hand. 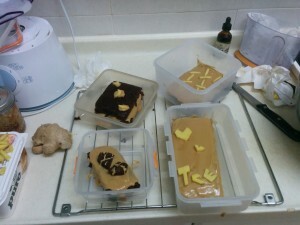 Instead of just frosting the top, I covered the sides and insides of some cake parts. My favorite lookin’ shimmery brown master piece was cut at an x-axis and made into a frosting sandwich. Topping the cake was fresh ginger cut into shapes that looked like french fries, letters, and hearts, as well as some cake parts and frosting drizzle (I didn’t add candied ginger, more sugar seemed excessive). I want to eat this cake again–maybe without frosting or a less sugary frosting–and soon. Everyday is somebody’s birthday. One Response to "Ginger Cake with Espresso Icing"
Now this definitely looks like my kind of thing! Great recipe, thanks a lot for the share, will definitely give it a try!